Whether or not you’re in the jet-setting crowd, you’ve likely heard about Monaco and the glamorous crowd who vacations in this Riviera hot-spot. It’s been the playground of the ultra-rich for decades, owing its glamor to Princess Grace (once Hollywood actress Grace Kelly) and her dashing husband Prince Rainier, who transformed into the top-spot for wealthy holiday goers. Monaco is celebrated for the lavish lifestyle of its uber-rich and super-famous. They either jet in or arrive by a chauffeur service. Even better, some of the world’s most jaw-dropping mega-yachts cruise here to anchor in port while its occupants dine and dance the night away. Monaco hosts exclusive activities fort his elite class during high season. One of the most anticipated events actually occurs in the harbor of Port Hercules. From September 26th through the 29th of this year, Monaco will host the annual Monaco Yacht Show. Some of the most extraordinary yachts, including new launches never before seen, will be on display during these 4 glittering days. You can imagine the international crowd that it will attract—wealthy yacht owners and their entourage from every corner of the globe descend upon this principality to peruse the latest super-yachts and many other luxury items. This year promises to thrill attendees for other reasons besides the spectacular watercraft displays. 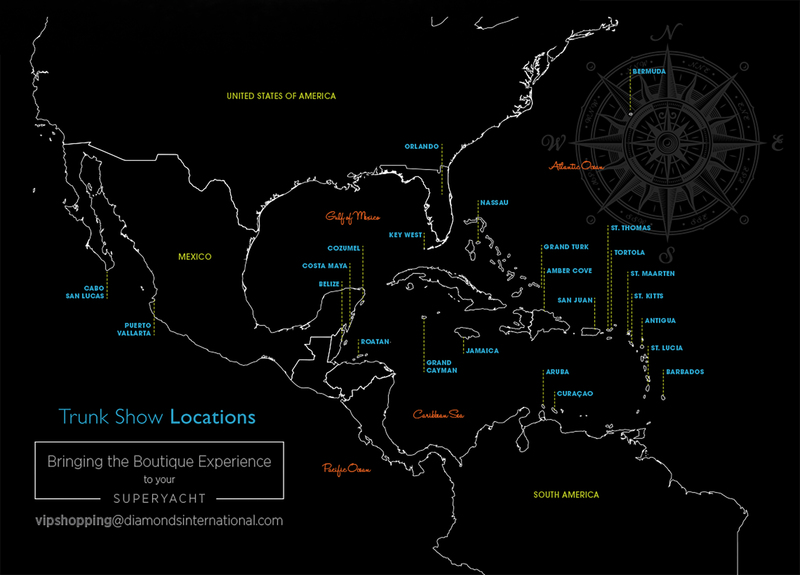 This time it offers something never before included in the storied yacht show—breathtaking diamonds courtesy of Crown of Light, Diamonds International’s exclusive diamond brand. For the first time, the Crown of Light Couture Collection will be showcased at the Monaco Yacht Show. The distinctive Crown of Light diamond is gaining global praise for its incomparable beauty and superb light-performance. This head turning effect is achieved by a patented cutting pattern of 90 expertly arranged facets which optimize the diamond’s fire and sparkle. The Couture Collection is an exciting new addition representing the echelon of the Crown of Light diamond story. Each hand-selected diamond in the collection is graded prior to placement in a finished piece of jewelry. The result is original one-off jewelry highlighting a triumph of artistry. As the Crown of Light Couture Collection makes its debut at the magnificent Monaco Yacht Show, no effort has been spared to make it a truly luxurious shopping experience. Attendees browsing the Crown of Light Couture Collection will have a selection of items delivered to their yacht for a private showing. No one must set foot off their deck to browse through the magnificent collection. Almod’s CEO and President, Albert Gad will be on-hand throughout the entire show ensuring that the utmost in VIP care is given to each individual customer.